You are here: Home / Self Publishing / Publishing Towards Success! Many authors make a very common mistake, they spend years thinking, writing and publishing their pride and joy and once it’s launched for the whole world to see—THEY SIT AND WAIT. Sitting and waiting for a book sale is one of the best ways towards failing in the publishing industry, and it is an industry and you are the creator of a product. Something authors must understand is that no matter how emotional the journey has been towards getting your thoughts on paper, most people out there simply do not care. So, how do you succeed in publishing? Get up and promote yourself, your book and your knowledge anywhere there is a person willing to listen to you. Do not use emotion to sell a book unless you have an incredible story, use your smarts! Acquiring the services of experts with insider knowledge and vast experience in the industry such as Cathy do have their place, they allow you to leapfrog ahead of where you’d be if you didn’t use their services but if you spent all your money on getting you from A (idea) to B (book) and forgot about C (marketing) then it’s a tough climb especially after a book has been released and you haven’t achieved much if any traction. Before you put neuron to electron, be sure to know what problem you are solving or how you plan on promoting your book and write accordingly. The traditional approach towards getting your book known do not work anymore except in a rare cases. Taking out a full page ad in the New York Times might get you some attention but I doubt it will get you enough purchases to offset the massive advertising cost… and that’s the problem. You spent all this time and treasure making your perfect book and left nothing on the table to actually promote it and current methods are just too expensive. Google Adwords sounds good but with a steep learning curve and awfully complex UI… I spent a few hundred dollars and failed miserably. FaceBook Adversiting is far more user friendly and you can target users all the better but nobody sees those ads… I spent a few hundred dollars and failed miserably. Print advertising, be it yellow pages, the local paper or flyers… I spent a few thousand dollars and failed miserably. Industry trade shows, setting-up a booth, going to networking events… I spent a few thousand dollars and failed miserably. Let’s define miserably here, it’s when you fail to recoup the costs you paid for an advertising campaign – you lost more than you made. I built an entire business around my books – they are important but only one small cog in the machine – you really must diversify yourself, be that consulting, blogging or whatever else other authors seem to do to make money. Relying only on your book to make a living is extremely rare. Don’t write just one book and wait for sales before writing your next… write and write and write! I have some books that have done great while others have… you guessed it… failed miserably. Write a series, create volumes of work! Each new book is a new opportunity for a reader to find you and buy your other books in the process. You turn one sale into many! Authors love connecting with other authors, we don’t always buy each others books (too many and not enough time to read them all) but we do have incredible advise to help you succeed. Maybe I failed because of X but another author succeeded dramatically because of Y. If you don’t know why you failed or a way to put it in context, then you didn’t learn your lesson hard enough and will sadly repeat it. “Yeah, that’s easy for you, you have all these machines, creativity etc… ” but when I wrote my first book on CNC machine design, I had NO machines – I didn’t even know they existed when I first started my business! I had no “formal creativity” meaning classes – it was just me and a laptop in a foreign country that I didn’t speak the local language. I saw a blank screen and MADE SOMETHING. Here’s one of my first design… took me two weeks! Impressive? Absolutely not! But after 5 years, he’s the stuff I’m making.. far faster than the original fish from above! If I can make such a dramatic jump from nothing… SO CAN YOU! Your first book will be your hardest but also most rewarding… keep at it and you will grow something out of nothing! 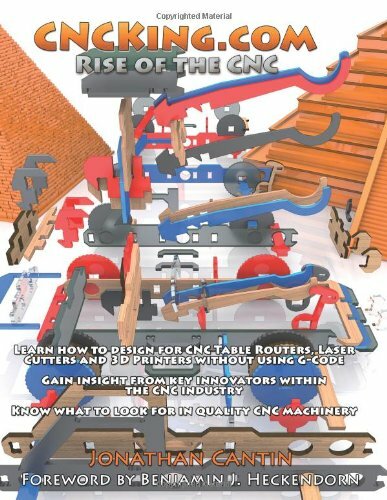 Jon Cantin is the author of CNCKing.com Volume 4: Rise of the CNC – Ultimate CNC Design Course, available at Amazon.com. If anybody has an questions, feel free to ask!